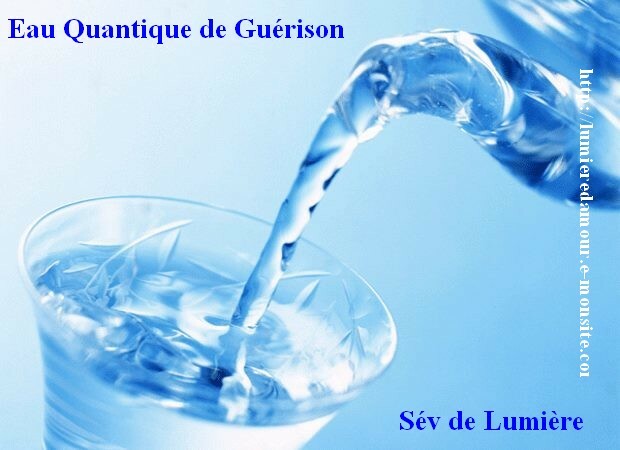 "I now receive healing quantum water, adapted to my case (or my problem, or my energies), which is offered by Sev de Lumière for my greater goodness." You can do this with your children, if they agree. For those who can read, they will say the sentence themselves. For the little ones, hold the glass for your child ...... here is the sentence. "I now receive healing quantum water, adapted to the case of my son or daughter ______ (add his name), which is offered by Sev de Lumière for his/her greatest goodness." "I now receive healing quantum water, adapted to the case of my dog, rabbit, bird's catou .... ______ (add his name), which is offered by Sev of Light for his greatest goodness thank you." "I now receive healing quantum water, suitable for watering my plants that is offered by Sev de Lumière for their greatest good thank you." PS: this does not replace your doctor or your medical treatment !! !